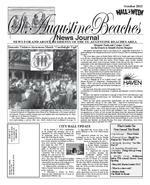 St. Augustine Beaches News Journal October 2012 3 City Hall Update MICHAEL A. DAGOSTINO, O.D. ELIZABETH K. MCLEOD, M.D. MEDICARE PARTICIPANTS ACCEPTING NEW PATIENTS 1400 U.S. Highway 1 South 829-2286 TODD P. THOMPSON, M.D. PAUL W. HUND, III, M.D. N. PATRICK HALE, M.D. Best Vision Center 10 Years WE ACCEPT MEDICARE, BLUE CROSS & BLUE SHIELD, UNITED, CIGNA, AND MOST MAJOR MEDICAL HEALTH PLANS. TODD HOCKETT, O.D. 319 West Town Place, World Golf Village 940-9200 RUSSELL W. NELLIGAN, M.D. * *Cornea Specialist (continued from page 1) 9. Approved holding a "shade" meeting on Monday, September 24th, to discuss a proposal from the police union. 10. Approved the use of the commission meeting room as a voting site for the November 6, 2012 general election. 11. Approved holding the November regular commission meeting on Tuesday, November 13, 2012 because the meeting room won't be available on Monday, November 5th because the room will be used for early voting. 12. Took no action on a proposal to have city lapel pins to promote economic development. 13. Approved three budget resolutions to amend the Fiscal Year 2012 budget. 14. Took no action on the topic of individual city commissioners involved in legal matters that may concern the entire commission. 15. Directed the city attorney and the city manager to clarify whether it takes a simple The commission continued discussion of a number of topics on the agenda for its September 10th meeting to its special meeting on Monday, September 24th. Max Royle, City Manager City of St. Augustine Beach 2200 A1A South St. Augustine Beach, FL 32080 904-471-2122 PLEASE NOTE: Under Florida law, most communications to and from the City are public records. Your e-mails, including your e-mail address, may be subject to public disclosure. whose mission is to is to have a positive impact on the lives of those affected by breast cancer in St. Augustine and the surrounding areas. Through their annual 5K walk/run, Pink up the Pace raises money to assist the uninsured and underinsured in the early detection of breast cancer and increase public awareness of the importance of early detection. For the second year in a row, Carter's Jewelry is partnering with PUTP by participating in their race expo and donating to their cause. This year Carter's is going one step further. Saturday October 13th will be "PINK" Day at Carter's Jewelry. Ten percent of the day's proceeds will be donated to Pink Up The Pace. There will be a drawing to win a breast cancer awareness necklace as well as specials and discounts throughout the store all day long. Identify yourself as a breast cancer survivor or warrior and you will receive a gift. There will be a craftsman on hand to inspect and repair your jewelry while you wait, get your watch battery changed or have the gemologist appraise your valuables. Every service provided as well as every piece of jewelry sold will help to support early detection of breast cancer in our own town. Carter's Jewelry is located in the Anastasia Publix Plaza at 1021 A1A Beach Blvd. The hours for "PINK" Day will be 10am 4pm, Saturday October 13, 2012. Call 904-471-1023 for more information or visit www.cartersjewelry.net. Breast Cancer Awaremess at Carters Jewelry Coming from Ohio.... GO BUCKEYES! My family through marriage owned and operated a well know Hungarian hot dog restaurant in Toledo, Ohio called, Tony Packo's Hungarian hot dogs. If you have ever watched Mash, Klinger talked about Tony Packo's restaurant in several episode's. Tony Packo's was also know for their signed hot dog buns on the wall from MANY famous people. Unfortunately, they sold all the restaurants after many years. After being down here for 18 years I decided to open my own hot dog restaurant. It's a small but friendly atmosphere and I'm ALWAYS open to suggestions! My hot dogs and my CONEY ISLAND sauce comes from Flint Michigan, they have that snap out for yourself and mention you saw this ad and receive Come see what we have to offer. Kim Packo, owner. See us at www.beacheshotdogs.com or email beacheshotdogs@att.net. Beach Hot Dogs Comes to St. Augustine Beach Tripadvisor of Newton, Mass. has announced that La Fiesta Ocean Inn & Suites and Beachfront Bed & Breakfast owners Rich & Lauren O'Brien have been awarded their earned from travelers. They both received congratulations from company President, Christine Petersen. La Fiesta Ocean Inn & Suites Beachfront Bed & Breakfast The Friends of Anastasia Island Branch Library (FAIBL), 124 SeaGrove Main Street, SeaGrove Town Center, St Augustine Beach, will be holding their Fall book sale on October 18, 19, 20, 2012. 10 am to 5 pm. Books are donated by the community as well as discarded books by the public library. Approximately 15,000 books/items will be available. like-new coffee-table titles from $2 to $50 each. include specially priced items). Inventory is comprised of about 90% donations and 10% library discards. These books have been sorted by volunteers to select those for special pricing. No commercial consignor has scanned our inventory since the last sale. A small collection of books are available on an on-going basis in the library for a $2.00 donation. Library staff selects books for their collection. Proceeds from the book sale are used for the library to purchase items on their wish list. The wish list includes the summer Florida Library Youth Program (FLYP) for children, adult/children/teen book collections and programs as well as specialized equipment (e.g., moviescreen, furniture) needed to implement targeted programs. The proceeds supplement funds from the county and with continuing cuts in the county budget, the money raised is critical to provide ongoing quality programs and materials. Questions? Claire Comstock at ccomst@comcast.net and leave a message. If email is not available, please call 471-2423 and leave a message (repeat name and phone # on the voice mail). October Anastasia Island Branch Book Sales The St. Augustine Travel Club will again be sailing the seas on St. Patrick's Day, Sunday, March 17 to 24, 2013, on the beautiful Royal Caribbean Freedom of the Seas out you who have never been on it, and, at a future Travel Club get together at the Southeast Branch Library we can view pictures of the ship. Prices start from $ 861.73 per person, double occupancy, for inside cabin, which include all port fees and taxes. Book now with deposit and receive $50 per stateroom On Board Credit. Call Peter, St. Augustine Travel Club at (904) 797-3736 for more information and reservations. St. Augustine Beaches News Journal October 2012 7 St. Augustine Beaches Ann Palmquist, Committee Member Palmquist@comcast.net Professional Packing, Shipping & Mailing Service Center (904)460-0022 With Safe ShipYou Have Options For info & directions please see www.safeshipstaug.com *NQMBOU%FOUJTUSZt $SPXOT#SJEHFTt $PTNFUJDt 8IJUFOJOHt 7FOFFSTt *NQMBOU%FOUVSFTBSUJBMTt $POWFOUJPOBM%FOUVSFTt t&YUSBDUJPOT t8JTEPN5FFUI t*7FEBUJPO t*NQMBOUT t#POF(SBGUT tJOVT&MFWBUJPOT t(VNVSHFSZ t-BTFS5IFSBQZ tPGU5JTTVF(SBGUT %%4.4I% %FOUBMVSHFPO0YGPSE Paradise is here... Paradise is here... Paradise is here... Paradise is here... Paradise is here...1 F Street 1 F Street 1 F Street 1 F Street 1 F Street St. Augustine Beach St. Augustine Beach St. Augustine Beach St. Augustine Beach St. Augustine Beach 904-461-8727 904-461-8727 904-461-8727 904-461-8727 904-461-8727 www.beachfrontbandb.com www.beachfrontbandb.com www.beachfrontbandb.com www.beachfrontbandb.com www.beachfrontbandb.comYour Hosts Your Hosts Your Hosts Your Hosts Your Hosts Over a year ago, it all seemed so simple, plant a garden and grow a community. Growing organic vegetables, two blocks from the Atlantic Ocean, in sandy soil, on land owned by the City was a challenge, but conversely organizing likeminded folk to grow a garden, promised an array sharing in the experience of building something beautiful from the ground up. Community Garden would not be a silly Jack in the Bean Stalk story but would enlist neighbors, homeowners, tenants, and condo dwellers, throughout the city, and invite them to share their ideas and experiences. Their response was heartwarming and encouraging from the beginning. The crucible, where the Community Garden was born, was far from the playwright Arthur Millers The Crucible, but closely resembling a wash tub. The repeated requests included: grow pesticide provide a space to all who want to could share the fun of gardening. The yearlong planning included: going door to door, two blocks in all directions, asking neighbors for suggestions, inviting them to meetings with leaders from the successful Lincolnville and always following directions in the sweet light of Sunshine. A time line set October 2012 pumpkins, grown by the neighborhood kids, would be ready for eager young gardeners to carve their own Halloween jack-o-lanterns that they had grown. The poet Ogden Nash said it best from goulies and ghosties and long-leggedy beasties and things that go bump in the night, Good Lord, deliver us! Inspired by this simple supplication and in the spirit of reconciliation perhaps a dose of wit and a fact or two will help moderate summers sticky climate because gardening is not for sissies and laughter has a special balm to heal bruised humor might be found in unlikely places such as: Gardening, and on truck bumpers Compost Happens. Fact: gardening requires lots of water most is in the form of perspiration also known pre-season your Zucchini harvest is never equal to imprint left after reading Poor Richards Almanac is like arguing with a bull, you are just going to piss the big guy off and running really fast is not exaggeration, and lastly a better movement is to Our historic time line reveals several garden related facts: by the time Columbus landed in the New World, corn had already been cultivated by indigenous people for more than 3,000 years. Todays indigenous inhabitants (read the Community Garden members) hope to carry on sooner. History and taste buds continue to played unexpected roles in the progress of the new world. Pilgrims considered tomatoes an abomination on a par with dancing, card playing and theater going and makes you wonder if those persnickety Pilgrims had tasted a lip smacking salsa, made from the humble tomato and the sassy datil pepper would the course of history take a new direction? WOW! What a winning combination, humility and attitude or as John Wayne might say, listen up Pilgrim, there is a gardener that needs thanking. Having true grit is more than using four letter words because when the shouting is done, silence is golden, and we are the community our children inherit. From day one the idea was to grow organic vegetables which reminds me of the man who went to the market: My wife asked me to buy ORGANIC vegetables. Have these been sprayed with any poisonous chemicals?" "No," replied the gardener, "you'll have to do that yourself." Adding humor is a lot like adding trace full ofmy way or the highway attitude. Several garden members have earned the designation of Master Gardener and have completed the course of study offered by University of Florida and have made the required commitment to give back to their community sharing lessons learned. Lucille Ball might have splained it this way, Gardeners live in a world of is a Sport. Hoe for It. Gee I love Lucy. Things that go bump in the Night Keep Your Trees Healthy Arborist will present An Owners Manual for Trees, October 18, 2-4 p.m. at the St. Johns County Agricultural Center, 3125 Agricultural Center Drive, St. Augustine. Instructors also Beverly Fleming, Master Gardener and Renee Stambaugh, Native Plant Consultant. For more information, go to www.nativeplantconsulting. com or call 209-0430. A job well done and thank you to Marc Chaten Director of Public Works, Kenny Gatchel Assistant Dir. and staff for the improved landscaping at the south entrance A1A Beach Blvd. Nice design and use of Florida Friendly low maintenance plants. Good Lord deliver us when things go bump in the night because we are still the community our children will inherit. Make a little history grow something beautiful. St. Augustine Beaches News Journal October 2012 9 Beaches Bistro By Paolo Pece, Cafe Atlantico cafeatlantico@comcast.net INSURANCE NETWORKFIRST FLORIDAFIRST FLORIDA IS ST.JOHNS COUNTYS PREMIER HOMEOWNER INSURANCE AGENCY St. Augustines Oldest Continuous Insurance Agency HOME REPLACEMENT YOUR HOMEOWNER INSURANCE PREMIUM ADDL DISCOUNTS AVAILABLE $200,000...............................................$578...............................home/auto discount up to 20% $250,000...............................................$763...............................home/auto discount up to 20% $300,000...............................................$912...............................home/auto discount up to 20% $350,000.............................................$1100...............................home/auto discount up to 20% $400,000.............................................$1027...............................home/auto discount up to 20% $450,000.............................................$1355...............................home/auto discount up to 20% $500,000.............................................$1503...............................home/auto discount up to 20% $550,000.............................................$1651...............................home/auto discount up to 20% $600,000.............................................$1800...............................home/auto discount up to 20% $650,000.............................................$1947...............................home/auto discount up to 20% $700,000.............................................$2098...............................home/auto discount up to 20% $750,000.............................................$2243...............................home/auto discount up to 20% $800,000.............................................$2390...............................home/auto discount up to 20% $850,000.............................................$2585...............................home/auto discount up to 20% $900,000.............................................$2687...............................home/auto discount up to 20%Prices based on 2010 Masonry Construction. East of the Intracoastal. Call us for the BEST rate for which you qualify. Quotes ar e subject to Underwriting Guidelines. St. Augustine Beaches News Journal July 2012 Issue Lamb with cilantro and cumin crust Contemporary Italian Grill 904-471-7332 647 A1A BEACH BLVD. ST. AUG. BEACH www.cafeatlantico.net Dinner Mon.-Sat. 5-Closing the old rule of thumb about serving red wine with meat. In this case, the strong green herb Sauvignon Blanc the wine of my choice. serves four Lean the lamb of all fat and silver skin. Brush with olive oil and sprinkle with salt. Process the cilantro with the cumin and cayenne pepper in a food processor. Add enough oil, one tbsp. at a time to make a mixture the consistency of jam, processing constantly. Spread the cilantro mixture on the lamb. Let stand at room temperature for at least 40 to 60 min., or in the refrigerator for 8 hrs. or longer. Preheat a gas grill or prepare a charcoal rare, or until done to taste when tested with the point of a sharp knife. Let stand for several min. Slice and arrange on a warm plate. Market Linked CDs were developed by Chase Manhattan Bank in 1987 and originally designed for their wealthiest clients. Since then Market Linked CDs have been offered to mainstreet USA by the worlds largest banks such as Barclays, Goldman Sacks, Morgan Stanley to name a few, with over $30 billion purchased in 2011. The development of Market Linked CDs came from the increasing demand of clients willing to limit their upside performance in order to protect their principle. Your principal $250,000 per account How do Market Linked CDs work? A Market Linked CD is an investment product based on one or more underlying asset classes, such as a basket of securities or market indices. Market Linked CDs are designed to provide investors with participation in the growth of the underlying assets while retaining characteristics of a maturity, A Market Linked CDs principal is protected. The return (if any) is based on the performance of the underlying assets during the term of the Market Linked CD. The rate of return is typically limited to a percentage of the return of the underlying assets and may also be capped. If the Market Linked CD is redeemed prior to maturity, the principal will not be protected and the investor may realize a loss, even if the underlying asset is appreciated. Who should invest in Market Linked CDs? While anyone can invest in Market Linked CDs, purchasers are commonly market growth, while receiving protection from possible declines. Young families, conservative investors, families saving for college, baby boomers, and retirees are examples of those who may choose to address these objectives by investing in Market Linked CDs. As an alternative investment product, Market Linked CDs can complement an overall balanced portfolio offering the potential to realize enhanced returns compared to traditional savings or deposit options. Consideration As with all investments or deposits, clients should review all of the risks associated with that specific deposit or investment. Market Linked CDs should be considered a part of a balanced portfolio. The following risks may apply: call, performance/market risk, liquidity risk, costs and tax treatment. In addition, although Market Linked CDs are FDIC insured, any purchase greater that the limits set by the FDIC is subject to the credit risk of the Issuer. Market Linked CDs combine the safety Any potential returns are typically limited to a percentage of the underlying asset upside and may be capped. A First Florida agent can more fully explain this investment. First Florida agents invite you to take their Quote Challenge. Call First Florida to discuss your current policy coverages. Their goal is to be certain you have the absolute best rate for which you qualify. Call 808-8600, come by to visit one of First Floridas friendly agents. Answering questions about Home Owner lawn equipment. Featuring Mow St Augustine Power House spokes person. St. Augustine Beaches News Journal October 2012 10 Phone: 904-236-6243 Email: undine@anastasialaw.net 4075 A1A S. Ste 200 St. Augustine, FL 32080 www.anastasialaw.net Mothers are often one of the most important and influential people in a persons life. I know mine is. She has become my best friend and the person I I really dont know what Id do without her. But things have not always been that way and as with most mother-daughter relationships weve had our rough patches. Through the years, as Ive grown and matured, Ive really come to appreciate my mother as well as recognize the true wisdom she possesses. She has stuck with me through thick and thin and has been my rock in all areas of my life. When I began my journey toward physical therapy several years ago my mother was behind me 100 percent. Although not a healthcare professional she gave me advice and help in any way that she could. She was behind me while I was in the Naval Academy, when I went to the Persian Gulf and when I went to PT school. It was she who encouraged me to specialize in womens health physical therapy. Although I didnt understand at the time her interest and support I began to learn the more I got into the womens health program. I also began to learn how much my own mother could have therapy so many years ago. All my life Ive known I was born via an emergency C-section. Ive never been accused of shying from a challenge and it seems this started with me early. My mom had the emergency C-section because I had the umbilical cord wrapped around not only my neck but my head as well. Always being grateful to my mom Im even more so now because I did not know the impact this procedure had on her. My entire life Ive heard the story of how Marisa entered the world and the events leading up to my delivery, but the story stopped there. Never was there discussion as to what happened after the delivery. It has only been the last few years and in part because of my womens health training that Ive come to learn of the on-going pain my mother had lived with. Unfortunately, my mother is like so many other women I now treat. My mothers abdominal and pelvic post partum pain is quite common. My mothers pain was not as severe as some of my patients and Im very happy Im able to help them, in part due to my mothers encouragement. I know throughout my life Ive caused through my words but as I said, Im learning. And what Ive learned is many women do not need to suffer the way my mom did. Im glad that I can now help mothers through the physical pain that their children may unknowing cause them in the months post partum. From a childs perspective, of any age, mothers are the center of the universe. I hope that each of you reading this column have come to appreciate your mothers as I have come to appreciate mine. I also hope that none of you mothers are suffering unnecessarily from post partum low back, abdominal or pelvic pain. If you are, please, please, please, consider the fact you may be a candidate for physical therapy. Give me a call. Thank you Mom for everything you have done for me. I love you very much! APTA in Pelvic Floor Dysfunction, Pregnancy and Post-patrum issues. She lymphedema therapist. For information or a complete listing of our therapists and their specialties, please call (904) 829-3411 or visit our website at www. Hello Beach Readers. Wow, what a September! We certainly appreciate the business we receive from the community. And also appreciate the opportunity to really test our skills as a Mower Repair shop. We have seen some interesting equipment come out of the wood work to be repaired. Thanks again Beach Readers. Well I tell you, one piece at a time. We offer a pretty quick turnaround in most cases, however this year has been one for the books. There were days the Service Department was taking in 20 plus units a day. Not including our Commercial Cutters equipment. That can make for some calculating decisions. On one hand we have our community to think of, on the other hand the Commercial Cutters have many customers to consider also. Carefully. Lets face it, when you have a companys lively hood parked in your yard with a blown engine or a failed hydraulic system, those are not inexpensive repairs not too much mention timely repairs. We diagnosis the equipment, get an estimate, call the customer and then get the parts on order for the repair. Without a doubt parts availability. Many distributors have moved warehouses away from local areas, many have various warehouses around the country, and you may very well get multiple parts from one distributor from multiple warehouses. And a lot of times those parts for that one repair may come from multiple warehouses. Good question, we keep anywhere from 100 to 150 thousand dollars in inventory, But in a repair business that number could double and still not have everything. We run a state of the art software system that allows us to view daily what is needed for repairs and for stock. For the month of October we have the $29.95 Chain Saw Tune Up Special along with leaf blowers on sale. Save up to $40 dollars instantly. Stop by the store for more details, or visit us on the web. Thats all the time we have now, Thanks for the input Mow. So until next month, remember St Augustine Power House is located at 125 Pope Road, right here on the island. Visit us at www.staugpowerhouse.com and if you have any questions for Mow email him askmow@staugpowerhouse.com. Ask Mow? Answering questions about Home Owner lawn equipment. Featuring Mow St Augustine Power House spokes person.Hello Readers! After many questions and answers we have decided to post some typical email questions we receive about lawn mowers and 2 cycle hand held equipment. Let us Hello St Augustine, Mow, tell us about yourself! Tell me Mow, does Power House service consumer or contractor equipment? Easy Mow we get the picture big awesome lawn mowers are kewl... the repair of these types of mowers. What we want to do is be the house hold name for lawn Interesting Mow, so can the readers call you or email you with questions regarding there lawn mowing equipment? months article so all can learn from it. Great Mow, any advice to our readers for this month? Proof Note: Which best? TEMPLE BY THE SEA 2055 Wildwood Drive, St. AugustineServices: First & Third Friday Evenings of the Month at 7:30 p.m.Rabbi Mark N. Goldman A Reform Congregation904-819-1875www.templebetyam.org T emple Bet YamReach The Beach By U.S. MAIL! The Beaches News Journal reaches thousands of homes in the Beaches area by U.S. Mail. We Cover The Beaches Send us your news!